I decided to start doing this while I was packing up my things to move, because you know the best time to start a new project using techniques you’ve never tried before is while you are preparing for a major life event. I probably started it just to give myself a reason to not pack…I justified it by telling myself “well, you are doing something productive instead of packing so it’s OK!” I actually finished it the Sunday before I moved. I finished this during one of the most stressful weekends of my life. I was trying to get as much packing done as possible. Saturday I needed a break from packing. Foxy has been at my parents house since before Halloween to make it easier to show my apartment and get ready to move. I decided I would go to the local city animal care and control and pet some kitties to relieve a little stress. What ended up happening was that I brought home this sad little dog. 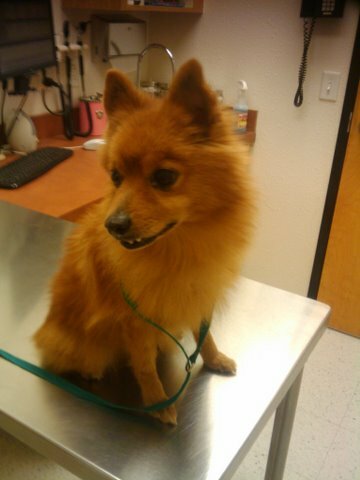 The poor thing had kennel cough, fleas, and messed up teeth. I don’t know what I was thinking, it was just an impulsive decision. Immediately after taking him out of ACC, I took him to the vet. He has all his shots now, is flea free, and got antibiotics for his cough. I brought him home. That night I was a mess. I felt like I had made a horrible mistake. My dog Foxy really does not get along with other dogs. I just couldn’t bring him back to that horrible shelter. I didn’t know what to do. I had just compounded my stress level by 1000. What I ended up doing is working with an adoption group called Alliance for Responsible Pet Ownership to try and find him a new home. They placed an ad on Petfinder.org for me. I have had at least a dozen people contact me who were interested in Pumpkin, but none of them followed through. It has been terrible. And the worst part is, the longer he’s with me, the more I’m getting attached to him, and I don’t think I will be able to adopt him out. I’m really conflicted and don’t know what to do. I’ve been so stressed out for the past month – my hair is falling out. I feel terrible and tired all the time. I cannot wait for Thanksgiving so I can have the time to just do nothing for a few days and hopefully relax. Anyway, back to this advent calendar. I used the tutorial that was on the Sew Mama Sew website. 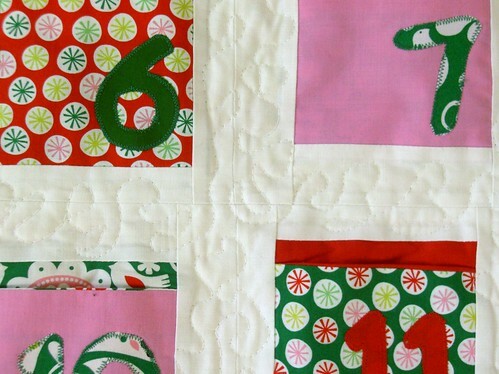 I pretty much used the same fabric too, Michael Miller Funky Christmas. I just really loved the prints in that collection. It was the first time doing any real applique, and that was probably what took the longest and was the most challenging. First I had to trace the numbers backwards on the double sided fusible webbing, and cut them all out. Then I had to iron on the numbers to the fabric I was using for the numbers and cut them all out. Then I realized that I had ironed on all the numbers that were on printed fabrics to the wrong side, so I had to redo half of them! Once I got that all straightened out, I ironed the numbers to the background fabric and began to satin stitch around the outer edge of the numbers on the sewing machine. It really took a long time to finish all of that. Once I had that done, and sewed the pockets together, the rest of it came together really quickly. I forgot to add, they are all little pockets to put treats in! I messed up the binding though. I was so tired on Sunday night, but I really wanted to finish. I didn’t realize until I was sewing the binding to the back (which I do by machine) that there was batting showing in the upper left hand corner…I hadn’t sewed the binding onto the top of the quilt there, I missed the edge. But instead of ripping the seams out and fixing it, I just sewed the binding so it covered the batting up, folded it over and finished the back. That’s why it looks crooked there. I just didn’t care at the time, but now it drives me crazy. There’s a couple of crooked pockets that bother me too, but I think overall it still looks ok. I need to dig my sewing machine out from the pile of unpacked boxes and at least put some things away so I have enough room in my “craft loft” to set it up so I can finish the blocks for the quilting bee before the end of the month. There’s about 4 projects I wanted to make before Christmas as well. Some will be really quick, like these bookmarks, and some not so much – I wanted to do a quilt as a gift for someone for Christmas…I hope I can get everything done in time! I have about 6 weeks, I think if I do a little every day, I’ll be able to finish all the stuff I had planned. Hopefully! First of all…breathe and “thank you” from Pumpkin…whom I’m quite sure is much more comfortable, healthy and cared for than he was before he met you. What happens from here is simply icing! And it will all work out. 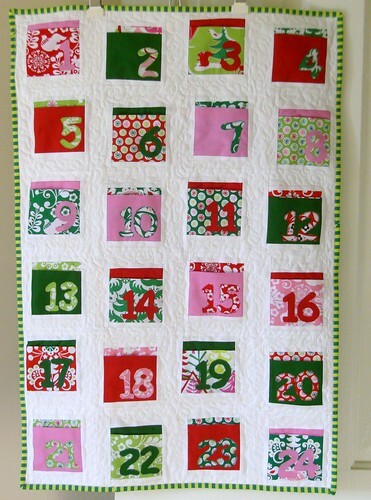 The Advent calendar (flashback to elementary spelling there! LOL) is adorable. Sometimes, it’s the trickiest things…the most frustrating things…that teach us the most. But, through all of this…you have a beautiful reminder of where you were when you started this and how far you’ve gone each time you look at it! There’s always an adjustment period when a new pet enters our life. I have 2 adopted dogs. They ignored each other for a couple of months when first introduced–but now they’re best friends! Just be the calm, caring owner you are now, K? Pumpin is better because of your help! Hi, my K-meleon browser is displaying your site weirdly just thought you may want to know. I can’t believe you’re not more popular since you definitely have the gift.